Startup Week Tampa Bay is celebrating five years of their community during this edition of Techstars Startup Week with a custom sticker sheet featuring eight different peel offs all themed around space exploration. We've been supporting the team in Tampa for a few years, from their Startup Week events to their Startup Weekend events. We've loved seeing their design aesthetic evolve as their Techstars partnership has evolved. 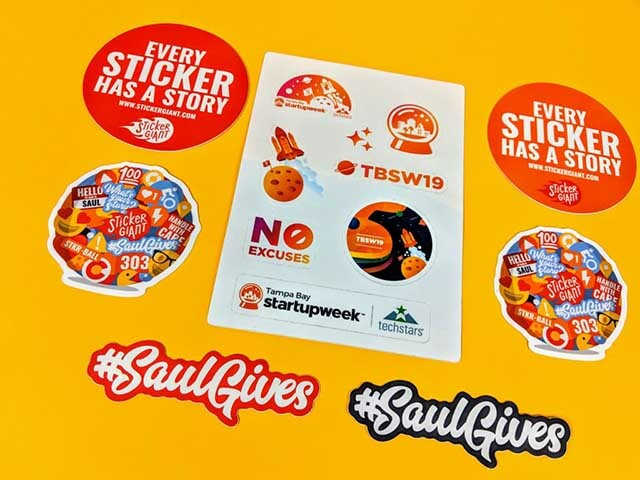 We wrote about them in 2015 for their first design, in 2016 for their Startup Weekend and then a sticker sheet for that year's edition of Startup Week Tampa Bay. In 2017 they printed a logo sticker for Startup Week and in 2018 they had a sticker sheet that had a bunch of great designs like this year's version. Startup Week Tampa Bay is a free five-day celebration with over 100 events led by entrepreneurs, and hosted in Tampa Bay’s hottest entrepreneurial spaces. Each day is loaded with sessions so attendees get the education they need for their startup, whether it's a panel about legal issues or a hands-on session about social media marketing. These classes are led by (volunteer!) entrepreneurs who have been there and done that. This action-packed week brings thousands of entrepreneurs, local leaders, and friends together to grow the Tampa Bay community’s unique entrepreneurial identity. When it comes to bringing people together with stickers, any event can benefit from a custom logo or fun sheet of designs. Attendees are able to take this gift with them and share the story of your event for years to come. Our partnership with Techstars has given us the opportunity to tell stories for hundreds of event organizers and thousands of budding business owners. We've been printing Techstars stickers for some time, and we love seeing all of the startup businesses that launch from this community of entrepreneurs. Here's to the fifth edition of Startup Week Tampa Bay!